Have you driven to Ford's lately? hey say you never really know how something smells until it's gone. I don't think that's true; it just depends on when you're there. 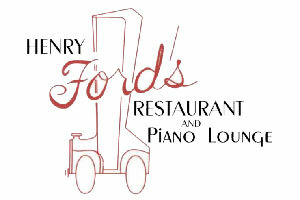 Take Henry Ford's Restaurant and Piano Bar, out in Southwest Portland, home of the greatest décor this side of 1955  along with the weirdest odor imaginable if you arrive before the lounge fills with smokers. Model-A Ford's: home of the greatest décor this side of 1955. It's something of a creeping mildew problem (I think), covered by timed blasts of potpourri air freshener, a smell that, thankfully, is covered by the aforementioned smokers. The extremely varied denizens of Ford's not only conceal the smell, they make for great people-watching, and make way (sort of) for interior design gawking, booze-slugging and listening to old-fashioned piano madness. 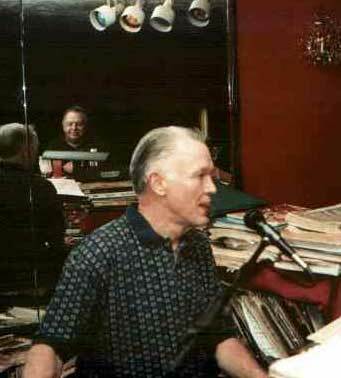 Indeed the lounge can get jam-packed on a Saturday night with a rotating cast of seniors waiting for giant steaks and all varieties of sartorial exhibitionists, sybarites and singers waiting for a turn at the microphone with silver-haired Lyle Chaffee on the keys. After a 10-minute wait we swoop down on a Prussian blue art-deco loveseat, in front of which lies in repose, the gruesome remains of a 26-ounce bone-in rib steak. It doesn't look too bad, actually, but a couple well-placed gin and tonics suppress an appetite soon enough. The room drapes itself in red velvet wallpaper and disturbing hanging collages of old keys, glasses and mustache trimmers. Dim candlelight glints off numerous gold accents and groovy globe lights, while a foam-filled fountain bubbles happily outside a panoramic window. Keyed in: Lyle Chaffee, with a few nods to modern electronics, renders any standard imaginable. This is the place Darrin Stevens goes for a midday drink to escape Larry Tate. A dowager heaves herself slowly up from the extensive dining area while an old duffer in khaki shorts and white tennis shoes crosses paths with a dude who looks like Blackie Onassis of Urge Overkill. I'm startled by a pair of Skeezix stockings on a white-faced lass, but distracted quickly as our hostess rises like a hawk to start crooning with Lyle. Chaffee's ensconced behind the piano bar with a few nods to modern electronics, a keyboard and drum machine, with which he renders any standard imaginable, from Sinatra to '70s rock. The canned beats are a bit cheesy, but the pianist knows his stuff, nailing every tune and finding homes for any number of shimmering glissandos. Tonight's standout is Lyle's mind-bending rendition of "Sloop John B," sung in a deep, warm baritone through his headset microphone. I have a hard time focusing in on exactly what are the other songs I'm hearing, but that's not exactly the point. If Chaffee's art inspires you, as it should, you can always choose a tune (hopefully one you know) and sing, too, reading over Lyle's shoulder as he guides you safely home. But even this bastion of old-school decency must seemingly accede to our accelerated culture, blasting Lyle's pretty black dots at us with numbing volume, possibly as a rebuke to all the noisy pint-pilots and martini-minders. Nevertheless, Henry Ford's seems a great place to swing back to yesteryear while listening to its employees and habitués warble. Alas, the peculiar smell may never be sniffed again, and we will miss it. 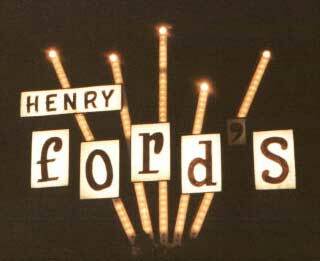 That's right, Henry Ford's will have pulled up stakes and steaks on its home of nearly 50 years by the time you read this. But not to worry. They have plans to retool and relocate in more happening waters around town and, as our server noted, they'll find a way to let everyone know where they end up  with Lyle Chaffee and his golden-years spirit, if not a new bolt of red velvet wallpaper, in tow.